St. Michael’s School for the Blind was founded in 1898 in Ranchi, India. It has been functioning since that time as a residential home and school for children who are blind. 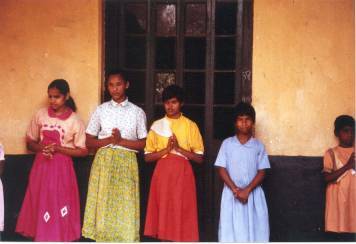 While in India on behalf of For The Children (FTC) I became aware of St. Michael’s School and their desperate need for support. 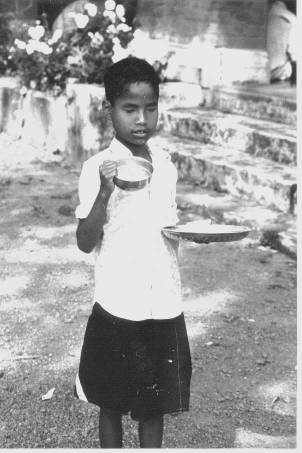 Since October of 1997 the director of SMSB has found it necessary to literally go door to door throughout the surrounding neighborhood asking for donations of rice to feed the children. The difficulty here is that the neighborhood is extremely poor, yet has somehow thus far managed to share what little they have. The extreme measure of canvassing the neighborhood became necessary when the restructuring of the grant providing institute created a total severance of funding to the school. This sudden loss of funding left the 85 student school and residential home completely without the necessary money to provide for the children’s needs. These children live their entire lives within the walls of the facility, therefore there are those who are no longer children but know no other home and must be cared for throughout their lives. The adults are taught to loom carpets and sheets and make cloths. There is a bamboo and cane workshop for the repair of cane chairs and the making of mats. While the residents of the school are working to achieve self sufficiency - this is a difficult goal to attain. It takes 8 hours of looming over a 7 day period to create a single sheet valued at $2.50 USD. When I toured the school-residential home and saw how simply the children lived it became clear that nothing was wasted here! In an effort to create support for these children FTC agreed to offer their child sponsorship program here. Anyone can become a sponsor or one time donor through a donation of any amount. The yearly budget of the residential home and school is $21,000, which provides for food, clothing and shelter, pays the teachers and allows for maintenance and upkeep of the aged structure. The children themselves live interdependent lives, working together as they help each other with their daily tasks of washing clothes, drawing water from the well, etc. They are schooled in Braille while studying in small groups. As I toured the dorms I heard an angelic choir, turning to see the origin of the celestial sounds, I looked into the faces of children - children who could not see ordinary light but who were enraptured in a higher light, which they offered through their song. This song captured my heart and brought tears to my eyes, tears of gratitude for the opportunity to serve as an avenue of support for these beautiful children.